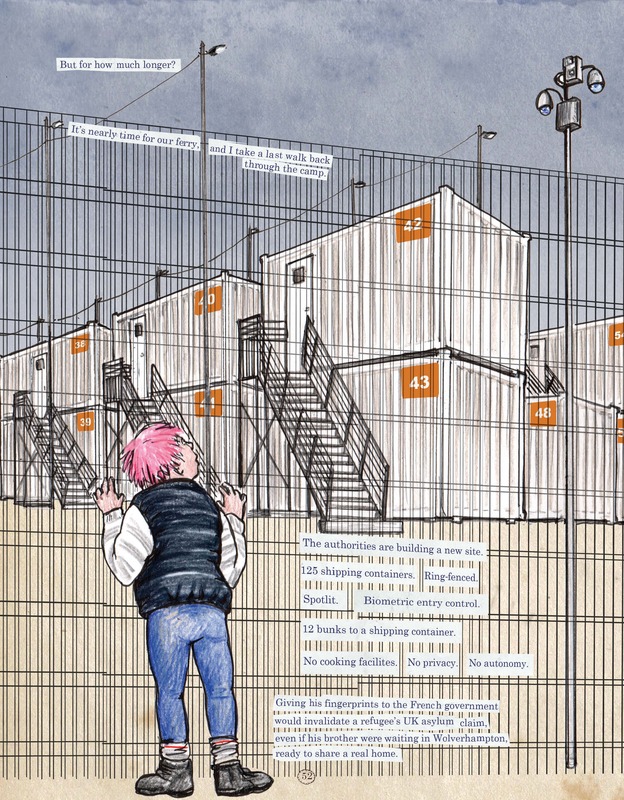 British cartoonist Kate Evans documents the lives of refugees stuck in French detention camps as they long to complete their journeys to England. 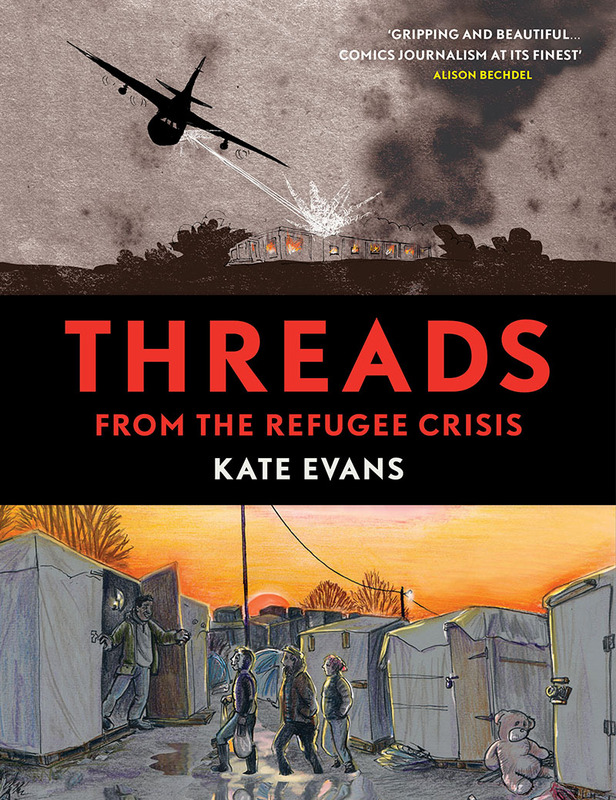 Her narrative spans from October 2015, when Evans first volunteered in the French refugee camp known as the “Jungle,” to September 2016, when the British government began construction of a wall in Calais to prevent refugees from stowing away in cars aboard ferries leaving the French port for Dover twenty miles across the English Chanel. The first chapter also began as the 14-page comic “Threads. The Calais Cartoon.” Evans distributed 12,000, crowd-funded copies to refugee support groups which sold them to raise further funds and public awareness. Later chapters also focus on the unnamed refugee camp in Dunkirk thirty minutes east of Calais. On her first trip, the camp is barely functional, only 24 toilets for 5,000 inhabitants. Evans helps construct temporary housing until her supply of staple-gun staples runs out. On her second trip three months later, the former “tool tent” is a warehouse of prefab house frames and electric saws. But in Dunkirk a month later, police enforce a tents-only mandate, preventing volunteers from entering with dry sheets and wood planks to raise tents from the inches-deep swamp of the former suburban park. While Evans is her own recurrent character, instantly identifiable by her cartoonishly purple hair, she focuses heavily on individuals living in the camps. She titles her sixth chapter after Hoyshar, an Iraqi father separated from his family and living with a friend in a seven-by-eight-foot shack on the outskirts of the Jungle. He makes Evans and her two fellow volunteers lunch in his “eighteen-inch kitchen,” and soon Evans is drawing her “Fairytale” of smuggling him across the channel to a waiting uncle. Instead they leave Hoyshar facing eviction because the replacement camp of shipping containers will be too small to house everyone after the Jungle is bulldozed. Instead of private family housing, each unit will hold twelve bunk beds and no individual cooking or personal spaces. Though the details Evans documents are all true, she acknowledges that to “protect some of the people described in this book their identities have been altered and some characters have been conflated.” It would be disappointing if Hoyshar or Evsar were composite characters, but Evans alters facts out of necessity. If refugees are registered or photographed while in France, the UK bars their entry. In the book’s most disturbing account, a team of police in riot-gear burst into a pregnant woman’s tent, strike her repeatedly in the face and hold her and her crying children’s faces steady in their black gloves as each is photographed and the photographs labeled. It is startling evidence of the power of images—not simply Evans’ but the legal documents that determine the futures of the individuals they depict. Before giving those portraits away, she photographed each to include in the narrative of her making them, juxtaposing digital versions of the originals with her later cartoon renderings of the same individuals. The effect is most paradoxical as she describes the intimacy of drawing someone’s face, including one sitter’s “impossibly thick eyelashes” and the “soft, downy hair growing on the upper lip.” As she narrates, she draws her pen drawing the lines of each feature—though when the pen is absent, it is impossible to determine if the image is a representation of a sitter or a representation of her portrait of that sitter. That peculiar merging of subject and depiction is at the heart of Threads and the genre of comics journalism in general. Despite the real-world seriousness of her subject matter, Evans works in a style associated with traditional newspaper comic strips named “comics” for their humorous content—as when Evans draws herself pushing an impossibly heaped grocery cart of camp supplies. When she includes an actual photograph of a garbage heap in Dunkirk, “a view from the nauseous woman’s tent,” she reminds readers that the book’s other images are recollected interpretations drawn after she returned home. She also implies that a drawing of the garbage wouldn’t adequately convey its reality. While engagingly expressive, her drawings are also gently distancing, dampening the immediacy of the actual camps. 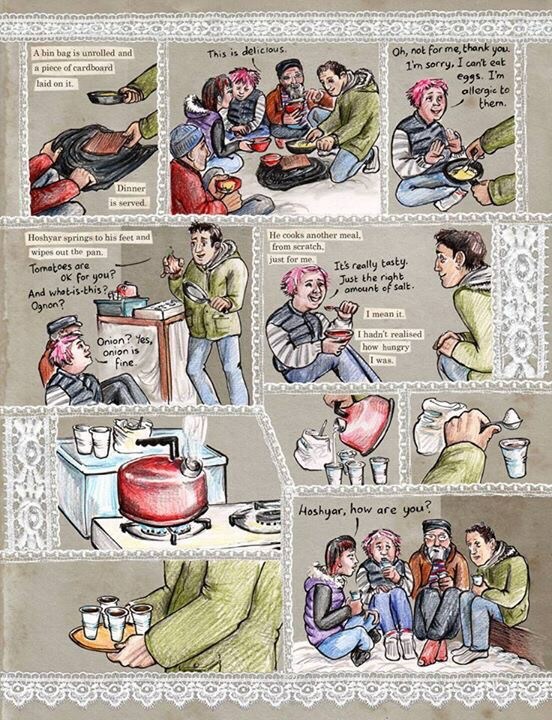 The comic doesn’t take readers to Calais and Dunkirk, but to counterparts in a colored-pencil universe. When her cartoon self yells at a border guard, “IT’S NOT A STORY!!! THIS IS REALITY!!! !”, Evans might be yelling at her readers too. But if her portraits of rightwing politicians Marine La Pen and Theresa May are intentionally warped caricatures, Evans grounds her book in our reality by including actual and far more grotesque statements from other anti-immigrant sources. Framed by a cellphone panel at the end of the first chapter, the first unnamed voice critiques Evans directly: “This cartoon could not be better propaganda for battlefield veteran Islamic militant males invading Northern Europe if Lenin himself produced it.” She includes more social media excerpts between later chapters, until they culminate in a spread of counter arguments literally scissored from newspaper articles and collaged across the two image-less pages. The style explains Evans’ approach to panel captions throughout. Her narration appears as strips of words layered overtop the artwork, subtly evoking a ransom note culled from newspaper articles. The addition of the physical words over images that take place in a constantly unfolding present moment suits the nature of retroactive narration. Speech in contrast is hand-lettered as part of the art and so part of those present moments, with no speech bubbles, only free-floating words linked to characters by single-line tails (a style long familiar to Doonesbury readers). When characters speak Arabic, Evans accordingly draws their words in Arabic letters, with translations provided by English speakers in the scene or not at all. She further grounds the physicality of her book through an inventive use of gutters. Instead of traditional empty spaces created by panel frames, her gutters are strips of white lace photographed and digitally manipulated. 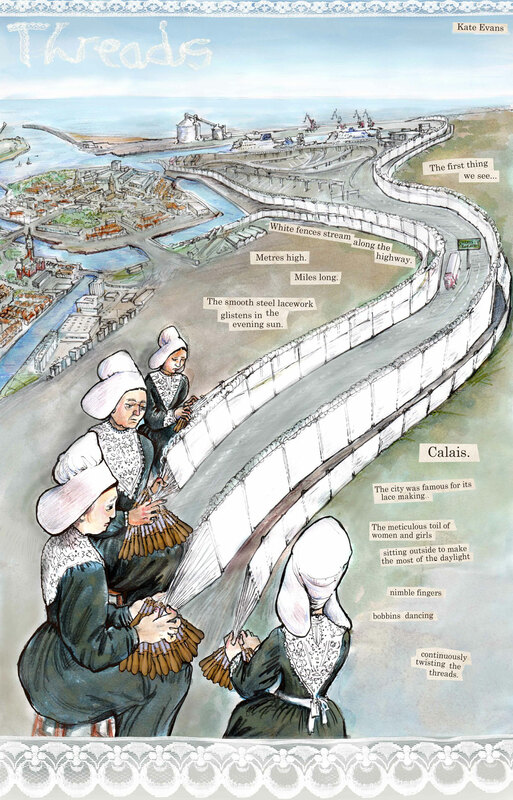 These titular “threads” reference the lace-manufacturing industry of historic Calais explained on the first page with an image of period-dressed women weaving the “steel lacework” walling in contemporary Calais’ highway. On the final page, Evans draws similar women cutting blocks of lace into bricks and stacking them into a new and higher wall around the port. The visual metaphor bookends the narrative well, emphasizing the power of comics journalism to not simply depict but to interpretively transform. 20/11/17 What is “Literary” Fiction? My last posts focused on the false division between science fiction and literary fiction, arguing that the two are often best when combined. If you don’t believe me, read Emily St. John Mandel. The author visited my creative writing class last week and read excerpts from Station Eleven to a packed auditorium. She said when she started out a decade ago, many editors rejected her first novel because it combined literary and genre fiction–she was all about crime back then. Now publishers love those combinations: literary mystery, literary scifi, literary fantasy, literary romance. The genre half of those phrases are fairly straight forward, but what exactly is “literary”? It’s a tough term to define, especially after decades of misuse. Some still confine it to “narrative realism,” meaning stories that appear to take place in what appears to be our own world. Literary fiction certainly includes those stories, but it also includes stories set in other kinds of worlds. The question is how to get to a “literary” world? I need to steer my creative writing students down some clear paths. Those paths have a tendency to change every century or so, so it’s usually a good idea to include “contemporary” in any definition too. Ultimately I don’t care where a story takes place–especially since all stories take place in fictional worlds, whether they superficially resemble ours or not. So rather than where, or even what (those fictional worlds can be peopled by gangsters or androids or talking hamster, it makes no difference to me), I just want to know how the story is told. That’s where “literary” resides. Exhibit an element of strangeness. Also not bad. Though I wouldn’t trust cockroaches to be your editor. The moment you communicate complete understanding to your reader, that’s called the last paragraph. Doesn’t matter if it’s also the first paragraph, or if you’re half way through your meticulously crafted plot outline–stop writing and let that projected ending resonate in your reader’s brain. I don’t think the list is quite done–Gardner’s “strangeness” is missing, but I don’t quite know how to articulate what exactly that means yet (which might be the point). And are those both the same as Barbara Kruger’s definition: “art is the ability to show and tell what it means to be alive”? I wasn’t expecting the post to draw attention beyond my usual readers, but it quickly became the third most viewed in this blog’s six-year history. I responded to a range of excellent comments last week, and, to continue that conversation, I am including below the four texts that Dan and I used in the experiment. Since they aren’t included in the actual journal publication, I can post them here unabridged. The conclusions that Dan and I draw refer specifically to these texts and so only tentatively to the larger genres of science fiction and narrative realism, which are each vast and diverse. We needed short passages, no more than 1,000 words each, and so the texts are also necessarily flash fiction. We had originally tried to alter actual published stories, but that produced too many variables. At the sentence level, our two texts vary only according to setting-revealing words and phrases, which then produce two drastically different story worlds, one set in a contemporary small town, another in a futuristic space station. That means any generalizations we suggest about the larger genres are limited to setting-based definitions. While narrative realism may include a lot of things, it typically includes a contemporary, seemingly real-world setting. But science fiction is trickier. Only a subset includes a futuristic, other-worldly setting, so our study is limited to that subset. By some definitions of science fiction, setting isn’t sufficient, since it is only a surface element. I tend to agree, though I still consider space westerns a form of science fiction. But the setting variations in the two experimental texts can produce more than just surface differences. When I tried a mini-version of the experiment unofficially with one of my advanced creative writing classes, one student inferred deeper levels of significance from the setting details, saying: “The main character feels a tension with humanity and artificial life; feels conflicted about the technological changes around him, the role that pain and messiness play in this structured, manipulated world.” No one described the setting of the narrative realism version as having as much significance. 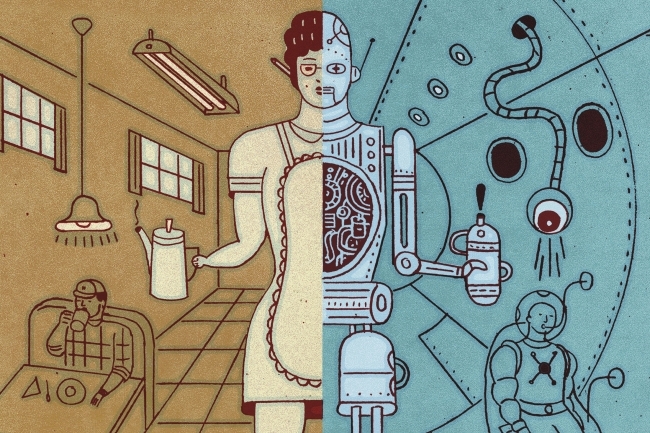 The question of quality might come in too, since setting-defined science fiction, while still a subset of science fiction, might indicate a lower level of merit. Personally, I consider both texts to be at best mediocre. I wrote them solely for the purpose of experimental manipulation. I’ve published about four dozen short stories in literary journals, including one anthologized in Best American Fantasy, but I would never submit these texts anywhere, regardless of genre. Finally, I’m including below the two additional texts that feature what Dan and I termed “theory-of-mind explanations.” These are topic-sentence-like statements usually at the beginning of paragraphs that declare overtly what characters are thinking and feeling. According to another study’s definition, “literary” fiction promotes theory-of-mind inferences, and so, we hypothesized, these statements should lower that inferencing and so also lower impressions of “literary” merit. That’s not what happened, which we discuss in the study. Jim takes a deep breath, bracing himself before pushing open the glass door. Mrs. Moyers glances at him once and then drops her eyes to her menu, which she continues reading with improbable intensity as Jim walks past her booth. Sally—a woman Jim dated back in high school—squeaks the heel of her sneaker as she pivots and vanishes into the shadows of the kitchen. An older waitress Jim doesn’t know by name eventually plods over to his table, slaps a menu on his placemat without a word or glance, and then continues to the next booth where she chats and giggles a full minute before taking orders. Jim’s letter to the editor appeared that morning. It isn’t a long piece, barely a half column, a fraction of the other Braxton Herald opinion page contributors. He was awake in bed just a few hours ago, staring at the shadows of his ceiling slowly ebbing to pink, when the delivery kid’s bicycle rattled onto the gravel of his driveway. The paper thunked against the screen door and skidded to the porch step where Jim leaned to pluck it up minutes later. There was no going back to sleep. He reread the letter under the glare of the kitchen light with the coffee machine hissing behind him. The words looked so official, the font so formal, nothing like the sheet of hand-written stationary he’d slapped into an envelope the week before. His hand had cramped from gripping the pen so hard, each letter gouged into the yellow of the paper. He’d ripped up the first two drafts, scattering their fluttery shreds across the kitchen tiles after he missed the wastebasket both times. If only he’d flung the pen in too, kicked the metal can skidding across the carpet. He didn’t skim to the bottom paragraph before crumpling his Herald into a jagged ball and shoving it into the same can. Now another copy sprawls across the unbussed table beside him, a smear of ketchup bloodying the masthead. That may be another jutting from Mrs. Moyers’ open purse, the pages rerolled into a tight cylinder like a weapon. When the waitress finally returns, she frowns down at him, sharpened pencil tip stabbing tiny wounds into her order pad. The waitress stands open-mouthed, eyes round, before retreating, her heels echoing against the tiled floor. Mrs. Moyers is suddenly standing and fishing bills from her purse. Sally—he didn’t notice her slinking back from the kitchen before—is drifting further down the counter, neck rigid as if afraid she might glance over by accident. He’d never said a mean word to her the whole semester they’d dated. But that was quite a few years and Herald editions ago. Jim glances at the neighboring table again. The puddle of ketchup has expanded into the headline. The paper is ruined. Even if he jumped up and started mopping the pages, he couldn’t repair the damage. He kicks his boots up on the booth seat opposite him instead. His soles might leave a dirt smear, but nobody else will be sitting there anytime soon. He smooths his hand across the wrinkles of his placemat, remembering how good it felt writing that letter. When Sally broke up with him senior year, he didn’t go and hunt down that runt of a junior she’d fallen for in her stupid Ceramics class. He didn’t jab the kid in the face till his bones of Jim’s fists throbbed and the calloused skin was wet with the other kid’s blood. Just yesterday his jerk of a neighbor let her poodle crap in his lawn again, not ten minutes after Jim had mown it, the air still thick with the scent of cuttings. But Jim didn’t yell at her, didn’t shout in her wrinkled face till his throat was raw. Jim arranges his fork and knife along the edges of the placemat now, gets everything flush and straight, the fluorescent lights in the polished metal. His meal will be here soon enough. Corporal Jones takes a deep breath, bracing himself before stepping through the airlock. Engineer Grady glances at him once and then drops her eyes to her mobile screen, which she continues reading with improbable intensity as Jones walks past her booth. Sally—a four-armed Alpha-Centarian Jones dated back at the Academy—squeaks the heel of her anti-gravity boot as she pivots and vanishes into the shadows of the galley. An ensign on server duty who Jim doesn’t know by name eventually plods over to his table, grudgingly projects a holographic menu over his placemat without a word or glance, and then continues to the next booth where she chats and giggles a full minute before taking orders. Jones’ message to Command appeared that morning. It isn’t a long piece, barely a full screen, a fraction of the other Colony Morale Survey respondents. He was awake in his bunk just a few hours ago, staring at the gray of his sky-replicating ceiling slowly ebbing to pink, when the satellite dish mounted above his quarters started grinding into position to receive the day’s messages relayed from Earth. The download light on his mobile screen plinked as Jim logged on seconds later. There was no going back to sleep. He reread it under the glare of his desk light with the air duct hissing behind him. The words looked so official, the font so formal, nothing like the electronic form he’d filled out by hand before slapping the SEND key the week before. His hand had cramped from gripping the stylus so hard, each letter denting the glow of the screen. He’d deleted the first two drafts, dragging their blinking icons to the cartoon wastebasket in the screen corner. If only he could have flung the stylus in too, kicked a real metal can skidding across the floor. He didn’t skim to the bottom paragraph before stabbing the CLOSE button and dragging the Survey to the same wastebasket icon. Now another Survey copy blinks from the unbussed table beside him, a smear of ketchup bloodying the table’s built-in screen. That may be another Survey glowing from Grady’s screen, the pages as bright as an exploding plasma grenade. The ensign stands open-mouthed, eyes round, before retreating, her boots echoing against the metal floor. Grady is suddenly standing and fishing mess hall tokens from her beltpack. Sally—he didn’t notice her slinking back from the kitchen before—is drifting further down the counter, neck rigid as if afraid she might glance over by accident. He’d never said a mean word to her the whole semester they’d dated. But that was quite a few years and Command Surveys ago. Jim glances at the neighboring table again. The puddle of ketchup has seeped into a crack in the screen. The viewer is ruined. Even if he jumped up and started mopping the table, he couldn’t repair the damage. He kicks his boots up on the booth seat opposite him instead. His soles might leave a smear, but nobody else will be sitting there anytime soon. He smooths his hand across the computer-generated wrinkles of his holographic placemat, remembering how good it felt writing how he felt for once. When Sally broke up with him, he didn’t go and hunt down that runt of an android she’d fallen for in her stupid Programming class. He didn’t jab the ugly droid in the face till the bones of Jim’s fists throbbed and the calloused skin was wet with synthetic blood. Just yesterday his jerk of a bunkmate let his pet space squid crap on his desk again, not ten minutes after Jim had cleaned it, the air still thick with the scent of ammonia. But Jim didn’t yell at him, didn’t shout in his wrinkled face till his throat was raw. Jim knows everyone in the diner will be angry at him. He takes a deep breath, bracing himself before pushing open the glass door. Mrs. Moyers glances at him once and then drops her eyes to her menu, which she continues reading with improbable intensity as Jim walks past her booth. Sally—a woman Jim dated back in high school—squeaks the heel of her sneaker as she pivots and vanishes into the shadows of the kitchen. An older waitress Jim doesn’t know by name eventually plods over to his table, slaps a menu on his placemat without a word or glance, and then continues to the next booth where she chats and giggles a full minute before taking orders. He knows why they’re mad. They consider him a traitor for insulting the town in their local newspaper. He called them all “parochial” and “small minded.” Jim’s letter to the editor appeared that morning. It isn’t a long piece, barely a half column, a fraction of the other Braxton Herald opinion page contributors. He was awake in bed just a few hours ago, staring at the shadows of his ceiling slowly ebbing to pink, when the delivery kid’s bicycle rattled onto the gravel of his driveway. The paper thunked against the screen door and skidded to the porch step where Jim leaned to pluck it up minutes later. He was too anxious. There was no going back to sleep. He regretted writing the letter even before he reread it under the glare of the kitchen light with the coffee machine hissing behind him. The words looked so official, the font so formal, nothing like the sheet of hand-written stationary he’d slapped into an envelope the week before. He’d been angry when he wrote it. His hand had cramped from gripping the pen so hard, each letter gouged into the yellow of the paper. He’d ripped up the first two drafts, scattering their fluttery shreds across the kitchen tiles after he missed the wastebasket both times. If only he’d flung the pen in too, kicked the metal can skidding across the carpet. He wishes he’d never written the letter, but it’s too late; everyone’s seen it. He didn’t skim to the bottom paragraph before crumpling his Herald into a jagged ball and shoving it into the same can. Now another copy sprawls across the unbussed table beside him. It’s as if they’re all thinking about killing him, the way a smear of ketchup is bloodying the masthead. That may be another jutting from Mrs. Moyers’ open purse, the pages rerolled into a tight cylinder like a weapon. The waitress is shocked. She stands open-mouthed, eyes round, before retreating, her heels echoing against the tiled floor. Others heard his comment, and that makes them fear what he might say to them if given the chance. Mrs. Moyers is suddenly standing and fishing bills from her purse. Sally—he didn’t notice her slinking back from the kitchen before—is drifting further down the counter, neck rigid as if afraid she might glance over by accident. He’d never said a mean word to her the whole semester they’d dated. But that was quite a few years and Herald editions ago. His friendships with everyone in Braxton are ruined. He just has to accept that he’s friendless now. Jim glances at the neighboring table again. The puddle of ketchup has expanded into the headline. The paper is ruined too. Even if he jumped up and started mopping the pages, he couldn’t repair the damage. He kicks his boots up on the booth seat opposite him instead. His soles might leave a dirt smear, but nobody else will be sitting there anytime soon. Maybe writing that letter wasn’t such a bad idea. He’d spent too much of his life not letting himself get angry. He smooths his hand across the wrinkles of his placemat, remembering how good it felt writing how he felt for once. When Sally broke up with him senior year, he didn’t go and hunt down that runt of a junior she’d fallen for in her stupid Ceramics class. He didn’t jab the kid in the face till his bones of Jim’s fists throbbed and the calloused skin was wet with the other kid’s blood. Just yesterday his jerk of a neighbor let her poodle crap in his lawn again, not ten minutes after Jim had mown it, the air still thick with the scent of cuttings. But Jim didn’t yell at her, didn’t shout in her wrinkled face till his throat was raw. At least now things are the way they should be. Jim arranges his fork and knife along the edges of the placemat now, gets everything flush and straight, the fluorescent lights in the polished metal. His meal will be here soon enough. Corporal Jones knows everyone in the space station mess hall will be angry at him. He takes a deep breath, bracing himself before stepping through the airlock. Engineer Grady glances at him once and then drops her eyes to her mobile screen, which she continues reading with improbable intensity as Jones walks past her booth. Sally—a four-armed Alpha-Centarian Jones dated back at the Academy—squeaks the heel of her anti-gravity boot as she pivots and vanishes into the shadows of the galley. An ensign on server duty who Jim doesn’t know by name eventually plods over to his table, grudgingly projects a holographic menu over his placemat without a word or glance, and then continues to the next booth where she chats and giggles a full minute before taking orders. He knows why they’re mad. He called the crew “parochial” and “small minded.” They consider him a traitor for insulting the base in an official report. Jones’ message to Command appeared that morning. It isn’t a long piece, barely a full screen, a fraction of the other Colony Morale Survey respondents. He was awake in his bunk just a few hours ago, staring at the gray of his sky-replicating ceiling slowly ebbing to pink, when the satellite dish mounted above his quarters started grinding into position to receive the day’s messages relayed from Earth. The download light on his mobile screen plinked as Jim logged on seconds later. He was too anxious. There was no going back to sleep. He regretted writing the report even before he reread it under the glare of his desk light with the air duct hissing behind him. The words looked so official, the font so formal, nothing like the electronic form he’d filled out by hand before slapping the SEND key the week before. He’d been angry when he wrote it. His hand had cramped from gripping the stylus so hard, each letter denting the glow of the screen. He’d deleted the first two drafts, dragging their blinking icons to the cartoon wastebasket in the screen corner. If only he could have flung the stylus in too, kicked a real metal can skidding across the floor. He wishes he’d never answered the questionnaire, but it’s too late; everyone’s seen it. He didn’t skim to the bottom paragraph before stabbing CLOSE button and dragging the Survey to the same wastebasket icon. Now another Survey copy blinks from the unbussed table beside him. It’s as if that report will get him killed, the way a smear of ketchup is bloodying the table’s built-in screen. That may be another Survey glowing from Grady’s screen, the pages as bright as an exploding plasma grenade. The ensign is shocked. She stands open-mouthed, eyes round, before retreating, her boots echoing against the metal floor. Others heard his comment, and that makes them fear what he might say to them if given the chance. Grady is suddenly standing and fishing mess hall tokens from her beltpack. Sally—he didn’t notice her slinking back from the galley before—is drifting further down the counter, neck rigid as if afraid she might glance over by accident. He’d never said a mean word to her the whole semester they’d dated. But that was quite a few years and Command Surveys ago. His relationships with everyone in the base are ruined. He just has to accept that he’s friendless now. Jim glances at the neighboring table again. The puddle of ketchup has seeped into a crack in the screen. The viewer is ruined too. Even if he jumped up and started mopping the table, he couldn’t repair the damage. He kicks his boots up on the booth seat opposite him instead. His soles might leave a smear, but nobody else will be sitting there anytime soon. Maybe writing that report wasn’t such a bad idea. He’d spent too much of his life not letting himself get angry. He smooths his hand across the computer-generated wrinkles of his holographic placemat, remembering how good it felt writing how he felt for once. When Sally broke up with him, he didn’t go and hunt down that runt of an android she’d fallen for in her stupid Programming class. He didn’t jab the ugly droid in the face till his bones of Jim’s fists throbbed and the calloused skin was wet with synthetic blood. Just yesterday his jerk of a bunkmate let his pet space squid crap on his desk again, not ten minutes after Jim had cleaned it, the air still thick with the scent of ammonia. But Jim didn’t yell at him, didn’t shout in his wrinkled face till his throat was raw. When the Lee statue was finally erected in 1924, the KKK controlled a majority of delegates in the Democratic National Convention. The Convention was held in New York city that year, and after the party defeated a platform resolution that would have condemned Klan violence, thousands of KKK members, including Convention delegates, held a celebratory rally in New Jersey. The following year, 30,000 Klan members marched in full regalia in Washington DC. National membership was estimated well over three million. The popularity of the Klan reflected the wider white nationalism of eugenics, which in the pre-DNA science of genetics argued for the hereditary superiority of northern Europeans. Following the advice of the Carnegie Institute, the Rockefeller Foundation, and other eugenics advocates, federal and state governments attempted to protect white bloodlines through immigration restrictions, racial segregation, anti-interracial marriage laws, and forced sterilization. Madison Grant’s white supremacist treatise The Passing of the Great Race became a national best-seller in 1916, calling for the sterilization of “worthless race types.” President Theodore Roosevelt and Adolf Hitler both praised the book. Hitler also said Germany needed to model itself on the U.S., especially California and Virginia, the leading states in the eugenics movement. I told my Superheroes class that on the first day of this semester because it’s the cultural and political context that led to costumed superheroes in comics. That’s not a condemnation of superheroes or of America. It’s just a historical fact, one we need to keep in focus in today’s cultural and political context too. Not all of America’s worst moments are in its past.